In this photo you can see the two ribbed open spandrel fixed parabolic arches. C.H. Purcell was state highway engineer and F.W. Panhorst was acting bridge engineer for the California division of highways and E.C. Panton was General Superintendent. This view by an unknown photographer is from the site of the Bixby Inn, Rainbow Lodge and later known as the Crocodile's Tail Restaurant. Bixby Bridge is one the most-photographed man made structures on the West Coast. It is 13.3 miles South of Carmel on California's Highway One. At its completion, it was one of the largest single-arch concrete bridge in the world. Bixby Creek Bridge is 714 feet long, has a main span of 320 feet long and over 280 feet high and the roadway is 24 feet wide. The temporary wooden 10x10 timber falsework structure used to support the bridge during construction was made of ten by ten inch timber's arch and was over 240 feet high. More than 6,6000 cubic yards of concrete and 600,000 pounds of reinforcing steel were used. We have photos of California Highway One, also known as the Pacific Coast Highway from the 1920's to today. The contract for the bridge was awarded to the Ward Engineering Co. for $202,334.00 on September 13, 1931. 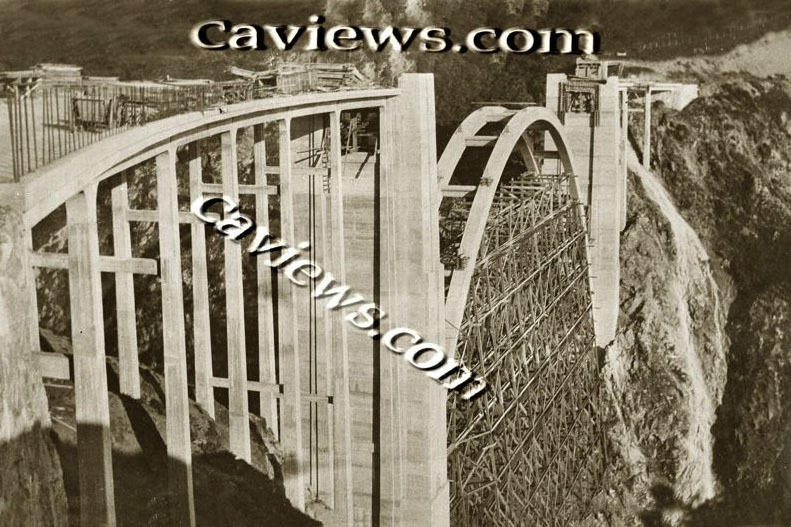 The bridge completed on November 15 and dedicated on November 27, 1932. Howard G. Sharpe and his wife Frida ran Rainbow Lodge on the old coast road in Mill Creek now Bixby Creek. It was from Bixby Inn on the new highway AKA Roosevelt Highway next to the Bixby Bridge that Howard G. Sharpe rediscovered the California Sea Otters in March of 1938. In September of 1966 Lady Bird Johnson dedicated it as California First Scenic Highway, a dedication was help with a plaque placed on a large granite boulder near the North end of Bixby Bridge, Big Sur. More photos of the Big Sur Coast, Point Sur and Notley's Landing just South of Rocky Point. 28,000 photos of Monterey County listed in our database. Copyright©2019 California Views Historical Photo Collection. To obtain permission to use any photographs please contact Mr. Pat Hathaway.